To wish to escape from solitude is cowardice. To assume power over is to soil. To possess is to soil. Belief in the existence of other human beings as such is love. The crime which is latent in us, we must inflict on ourselves. Truth is sought not because it is truth but because it is good. The light of attention ... is not compatible with polemical intention. Science affirms that ... Science is voiceless; it is the scientists who talk. 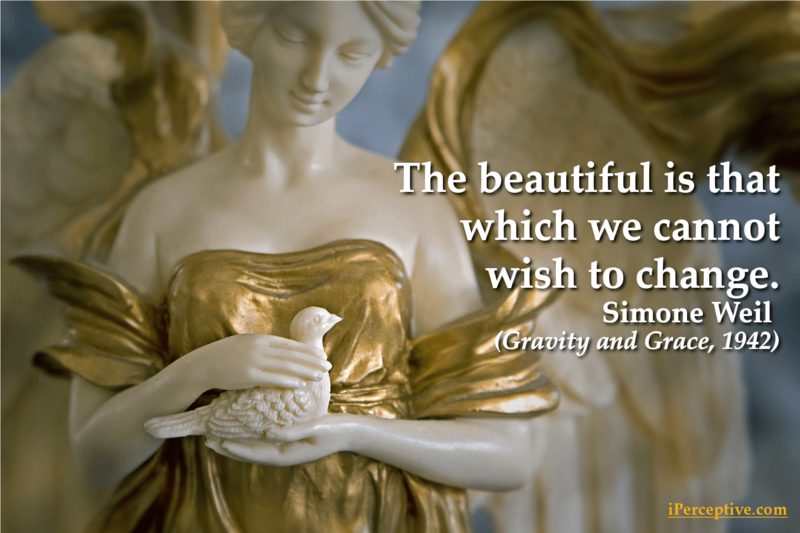 The beautiful is that which we cannot wish to change. Workers need poetry more than bread. They need that their life should be a poem. Love is the teacher of gods and men, for no one learns without desiring to learn..
To be innocent is to bear the weight of the entire universe. It is to throw away the counterweight. We do not have to acquire humility. There is humility in us—only we humiliate ourselves before false gods. Stars and blossoming fruit-trees: utter permanence and extreme fragility give an equal sense of eternity. Method of investigation: as soon as we have thought something, try to see in what way the contrary is true. Our science is collective like our technics. ... We inherit not only results but methods which we do not understand. The presence of the dead person is imaginary, but his absence is very real: henceforward it is his way of appearing. We are drawn toward a thing because we believe it is good. We end by being chained to it because it has become necessary. To strive from necessity and not for some good—driven not drawn—in order to maintain our existence just as it is—that is always slavery. Above all it is thus that we can acquire the virtue of humility, and that is a far more precious treasure than all academic progress. Above all our thought should be empty, waiting, not seeking anything, but ready to receive in its naked truth the object that is to penetrate it. Extreme purity can contemplate both the pure and the impure; impurity can do neither: the pure frightens it, the impure absorbs it. It has to have a mixture. The flesh is dangerous in so far as it refuses to love God, but also in so far as without fitting modesty it pushes itself forward to love him. As regards temptations, we must follow the example of the truly chaste woman who, when the seducer speaks to her, makes no answer and pretends not to hear him. The mysteries of faith are degraded if they are made into an object of affirmation and negation, when in reality they should be an object of contemplation. We must be like the father in heaven who does not judge: by him beings judge themselves. We must let all beings come to us, and leave them to judge themselves. We must be a balance. That which is perfectly pure can not be anything else but God present down here. If it was something else than God, it would not be pure. If God was not present, we would never be saved. Attachment is no more nor less than an insufficiency in our sense of reality. We are attached to the possession of a thing because we think that if we cease to possess it, it will cease to exist. The Greeks believed that only truth was suitable for divine things—not error nor approximations. The divine character of anything made them more exacting with regard to accuracy. We do precisely the opposite. Whatever I may have to bear, when God sends me suffering, I am inescapably forced to suffer all that there is to suffer. Why, when it comes to duty, should I not in like manner do all that there is to be done? That which we want is the absolute good. That which is within our reach is the good which is correlated to evil. We betake ourselves of it by mistake, like the prince who starts to make love to the maid instead of the mistress. We do not obtain the most precious gifts by going in search of them but by waiting for them. 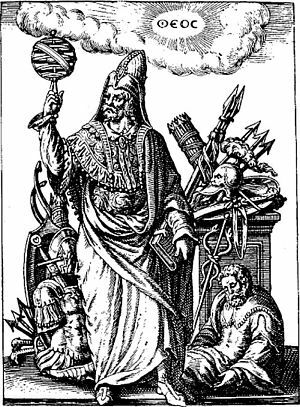 Man cannot discover them by his own powers, and if he sets out to seek for them he will find in their place counterfeits of which he will be unable to discern falsity. May the eternal light give, not a reason for living and working, but a sense of completeness which makes the search for any such reason unnecessary. Failing that, the only incentives are fear and gain—fear, which implies the oppression of the people; gain, which implies the corruption of the people. The use of reason makes things transparent to the mind. We do not, however, see what is transparent. We see that which is opaque through the transparent—the opaque which was hidden when the transparent was not transparent. ... Reason should be employed only to bring us to the true mysteries, the true undemonstrables, which are reality. The uncomprehended hides the incomprehensible and should on this account be eliminated. The best support for faith is the guarantee that if we ask our Father for bread, he does not give us a stone. Quite apart from explicit religious belief, every time that a human being succeeds in making an effort of attention with the sole idea of increasing his grasp of truth, he acquires a greater aptitude for grasping it, even if his effort produces no visible fruit. An Eskimo story explains the origin of light as follows: “In the eternal darkness, the crow, unable to find any food, longed for light, and the earth was illumined.” If there is a real desire, if the thing desired is really light, the desire for light produces it. There is a real desire when there is an effort of attention. It is really light that is desired if all other incentives are absent. Even if our efforts of attention seem for years to be producing no result, one day a light which is in exact proportion to them will flood the soul. Every effort adds a little gold to a treasure which no power on earth can take away. 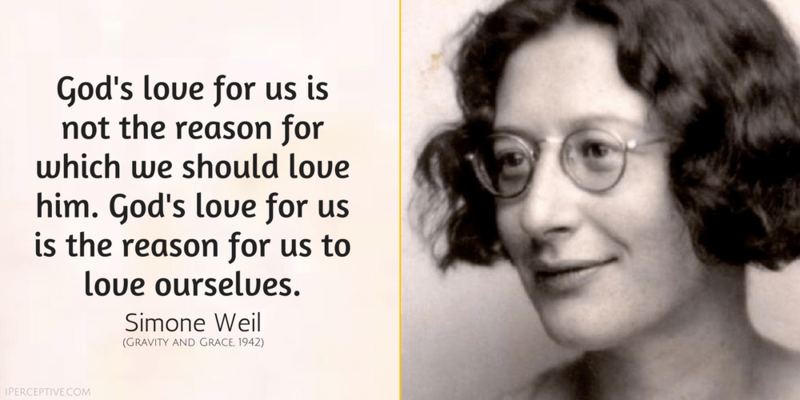 Simone Weil was a French philosopher and mystic. 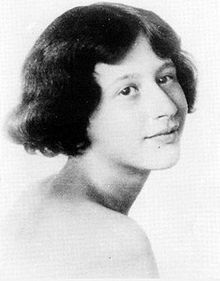 She wasn't so well-known or influential in her own time but her work came to see the light of day a couple decades later after her death. She was also involved in political activism.